Archibald Dexter, a hedonistic but adventurous and patriotic young man, joined the British Army at the end of the 18th Century. A hero in battle but in constant trouble in barracks, given a final chance for redemption he finds himself on the staff of Admiral Horatio Nelson. Trapped in Egypt following Napoleon’s invasion he will need all his wit and guile to survive and go on to play a pivotal role in Nelson’s victory at the Battle of the Nile. Wounded and thrown into captivity, he eventually returns to London where as a member of a secretive department of the Aliens Office, he will be called upon to fight fierce battles against increasingly violent French agents, plotting and murdering their way across the capital. Together with an oddball assortment of comrades Archie must travel to Spain on a deadly mission to rescue a British spy, the one man capable of enabling Pitt’s government to secure an alliance with a chance of defeating Napoleon. However it is back in London that he will face his sternest test, where failure will force him to choose between the life of his closest friend and the King of England. Having read novels for years by writers such as Bernard Cornwell, Julian Rathbone and others, I thought, I may not be able to that better but I can certainly do as well. 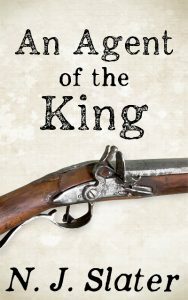 With a passionate interest in Napoleonic and 19th century history in general, this seemed the ideal genre to write in. The rest as they say is history. My characters have to fulfil a few basic requirements. They have to be interesting, flawed but exciting and appealing to the bad boy in all of us. It is important that they be believable for their time but that does not mean they have to hold conventional values of their time. Just like today, people in the 19th century held very different views and often had vary dark secrets in private lives. In some ways the one dimensional nature of many characters created by established authors is what inspired me to write myself.